Photinia 'Red Robin' is a very popular, vigorous evergreen shrub, which boasts glossy, bright red leaves, which give a spectacular display in spring and summer with clusters of small white flowers in spring. The leaves gradually change through a mix of oranges, purples and bronzes, maturing to deep dark green and the newest shoots retain a dark red glow all year. Red Robin is perfect planted as an ornamental shrub feature or is ideal for creating a dense hedge or as screening thanks to its speedy growth. Being evergreen, it brings colour to the garden all year round and its easily manageable so you can plant it up and sit back and enjoy all year long. Supplied as an established plant in a 3L pot ready for planting out. Photinia 'Red Robin' is a very popular, vigorous evergreen shrub, which boasts glossy, bright red leaves, which give a spectacular display in spring and summer. The leaves gradually change through a mix of oranges, purples and bronzes, maturing to deep dark green. The newest shoots retain a dark red glow all year.Red Robin is often planted as an ornamental shrub or as a fast-growing, dense hedge. 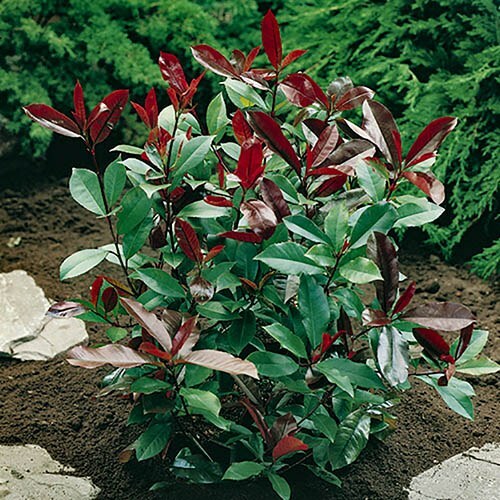 It produces clusters of small white flowers in spring, sometimes followed by red fruit - but it is the bright blood red spring foliage that really sets this hedging shrub apart. The colour is really intense and unusual, especially so early in the year, and being evergreen, has year round interest. A great and versatile shrub for hedging, screening, or as a backdrop, yet easily manageable in smaller gardens with annual pruning. Grows up to 30cm a year once establsihed. Supplied as an established plant in a 3L pot ready for planting out. 40cm tall, bushy. Specimen plants can be pruned or clipped up to 3 times a year to encourage the new red leaves to develop. Also known as the Christmas Berry, photinia 'Red Robin' grows best in fertile, well-drained soil in sun or partial shade. A sheltered position is best as the new growth can be scorched by drying wind or late frosts. Regular watering can cut down the risk of scorching. Really easy to care for, any pruning is minimal, and is usually just formative. Carried out before mid-summer, it allows new growth to harden off before winter.